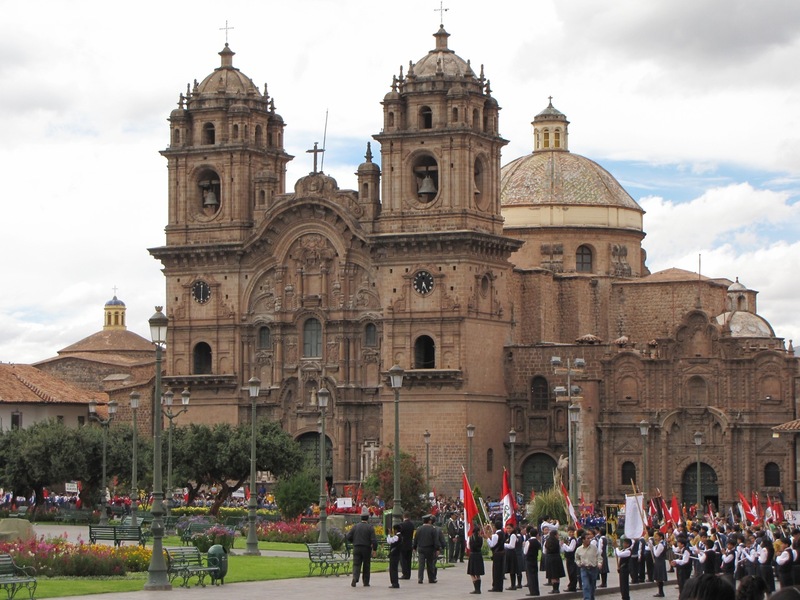 So, going back to May: After about a week in and around Cusco, I took an hour-long flight to Lima, Peru’s capital. My arrival in Lima marked the first time that I was below 3000m / 10,000ft in about a month (having been in Bolivia’s high desert and La Paz before that). The oxygen-rich air was thick and rejuvenating. Lima itself is moderately interesting; probably the best thing it has going is its excellent seafood restaurants, particularly the cevicherias. I had several memorable meals the two days I was there. 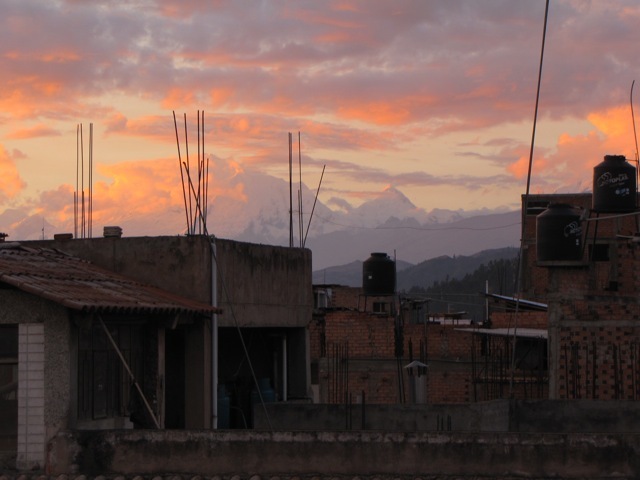 I left Lima quickly, before I lost my acclimatization. 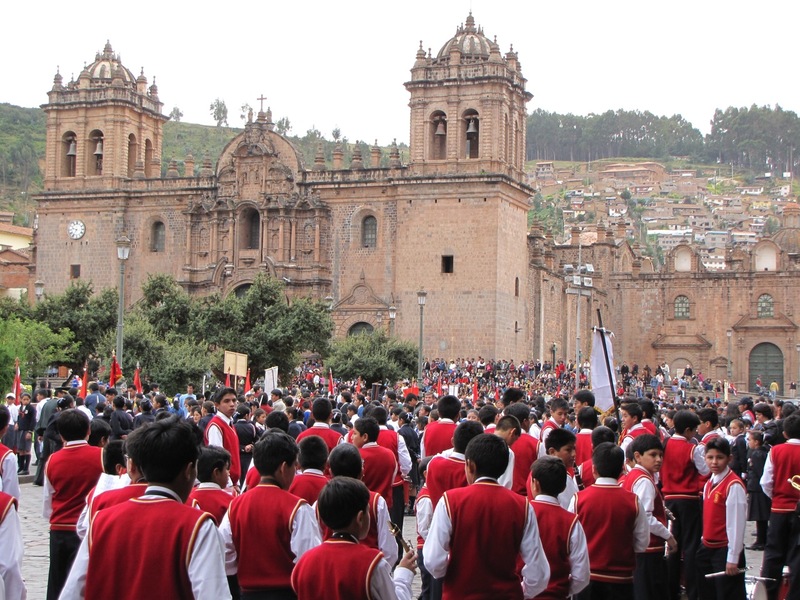 My next stop was Huaraz, Peru – one of the centers of high-altitude mountaineering in South America. 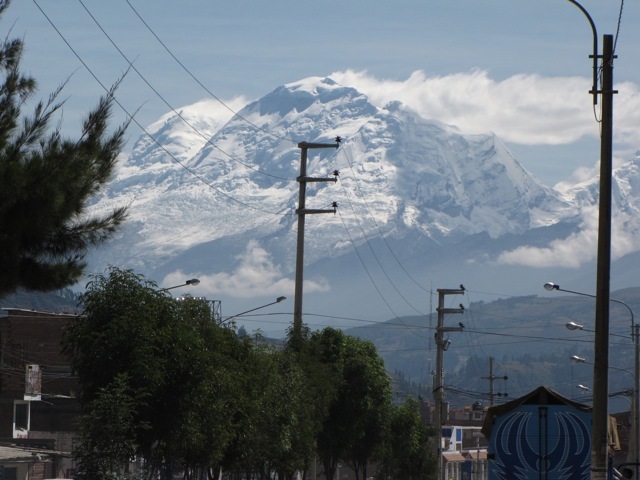 Nestled against the Cordillera Blanca, Huaraz is home to sixteen peaks over 6000m / 19,600 ft and dozens more over 5000m / 16,400 ft, and is close to the Cordillera Huayhuash, an even more impressive mountain range that is best known for being home to the epic survival story documented in the movie Touching the Void. 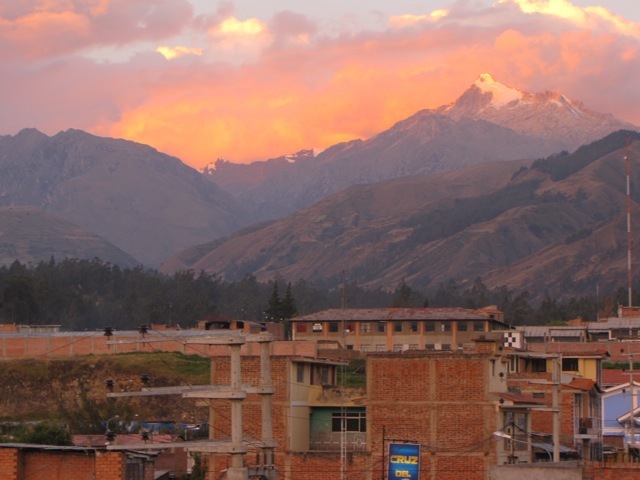 Huaraz is not a beautiful town, but the backdrop and views are amazing. 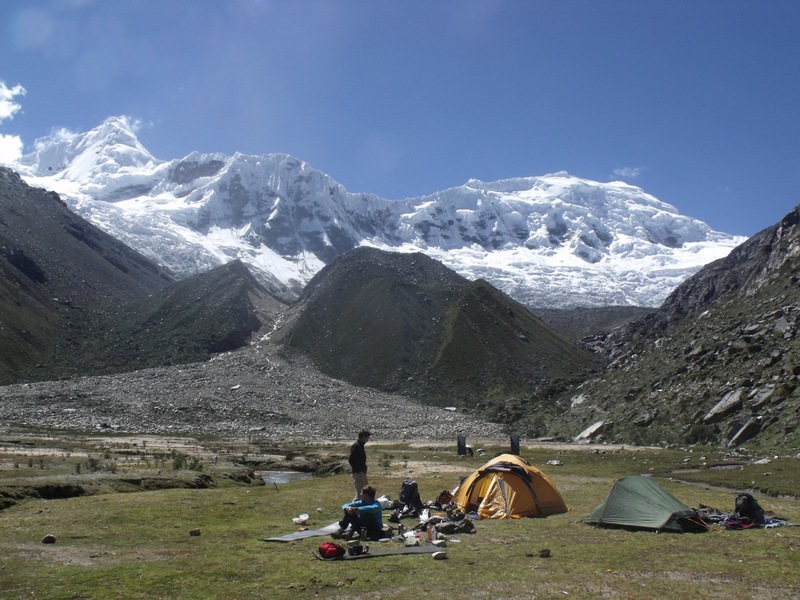 I quickly met several other climbers, some at the hostel where I stayed and others at Cafe Andino, an excellent bar/cafe/library/restaurant that serves as ground zero for alpinism in Peru. 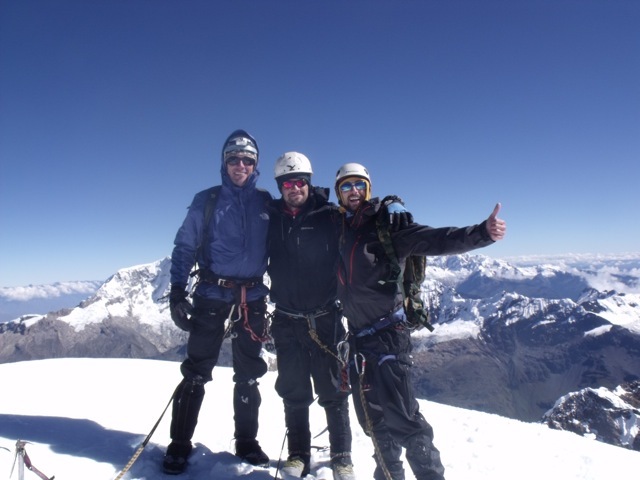 Within a few days of arriving I hooked up with two brothers from England, Sam and Sky, who were planning on doing some climbing as well. 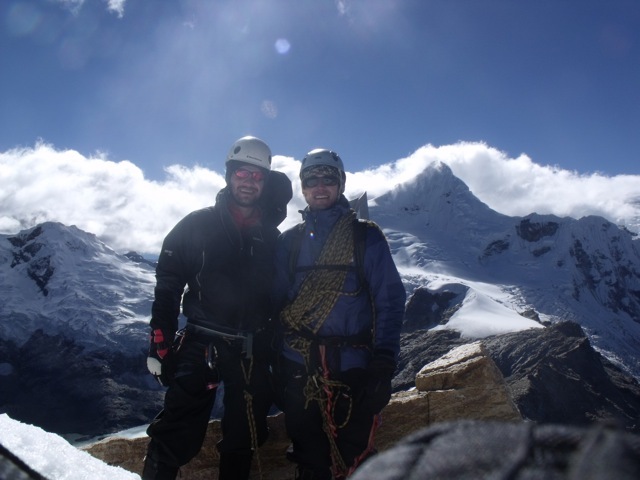 We decided that we would hire a guide to attempt Tocllaraju mountain, topping out at 6033m / 19,793 ft, and then, after a day’s rest, we would attempt another mountain in the same area without a guide. 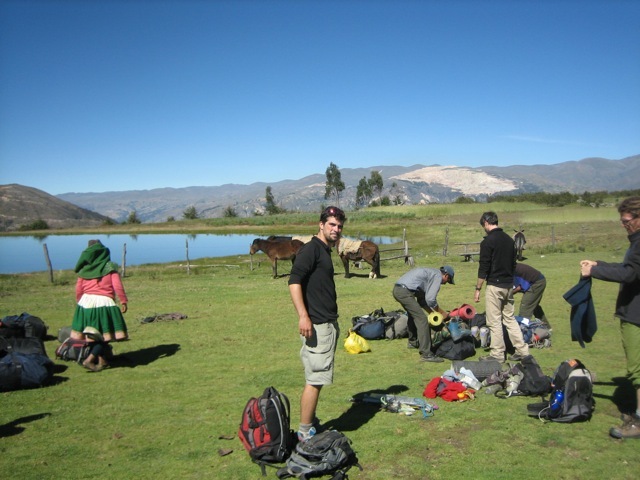 A jarring 2.5 hour ride, most of it over pock-marked dirt roads, took us to the pueblito of Collon, home to a few huts and donkeys, where we organized gear and loaded it onto donkeys and then embarked on the 8-mile hike to base camp – fortunately it was a pretty gentle grade. 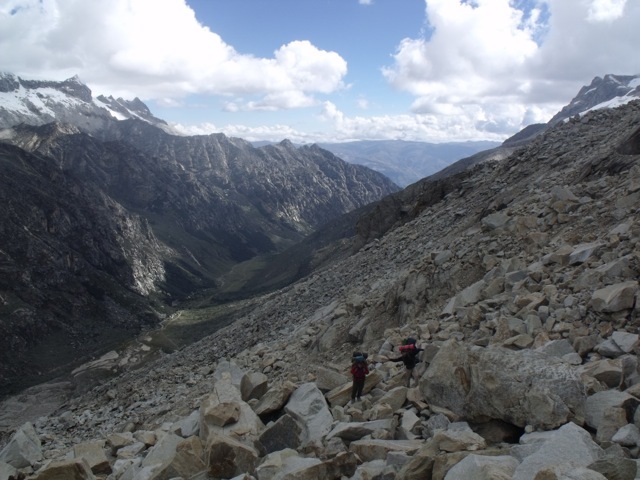 We arrived at base camp a few hours before our donkeys, so our plan to make it all the way to high camp in one day didn’t fly. Instead we relaxed under blue skies, leisurely set up camp, and had a pleasant dinner of ramen noodles. The next day at about noon we made the steep hike up an exhausting moraine field (lots of large boulders, poorly marked trail) for about 3 hours to high camp. We set up camp on the edge of the glacier, at about 17,000 feet, at a spot with an excellent view of the next day’s goal: Tocllaraju’s summit. Early the next morning, at about 1:30 am, after a perfunctory breakfast, we departed base camp, put on our crampons and roped up, and started the long hike across the glacier and snow fields to the Northwest Ridge, our route. 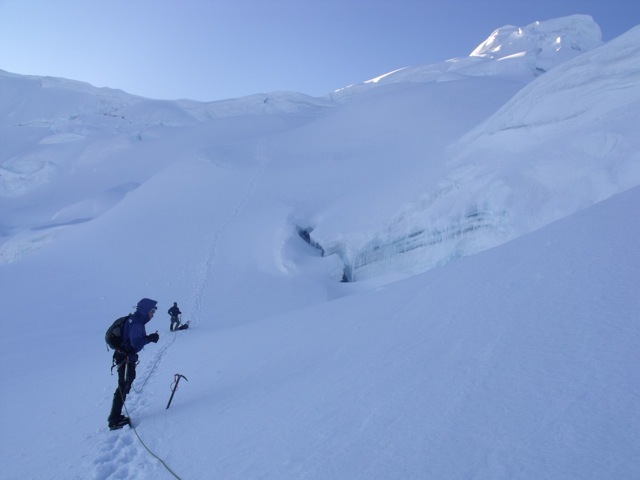 The first couple hours was of moderate angle, though still difficult because of the altitude, and presented a few spots where the route finding was challenging, especially with the abundance of crevasses. Then the climbing got steep, and super fun, with 50+ feet of climbing up to 80 degrees or more. 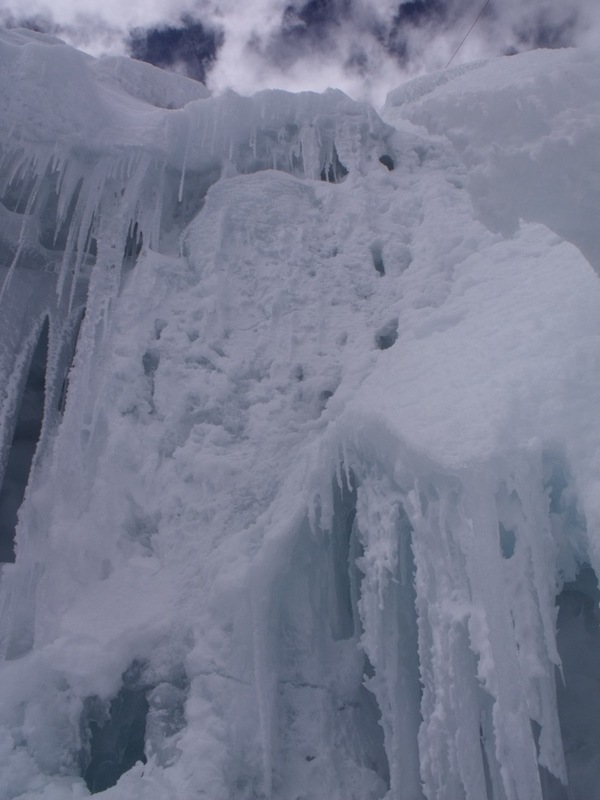 Being early in the climbing season, much of the route was still soft-ish snow, instead of compact ice, making solid placements with ice axes and crampons difficult, and the crux sections exciting. It was an absolute blast though, being that high up on such steep terrain. Aside from being short of breath the entire time, I had no problems with the altitude, though one of the brothers in our group was feeling the effects of the altitude in a pretty bad way, but to his immense credit he pushed on, even after ralphing. Had he been unable to continue, we would have all had to retreat; that would have been a huge bummer. 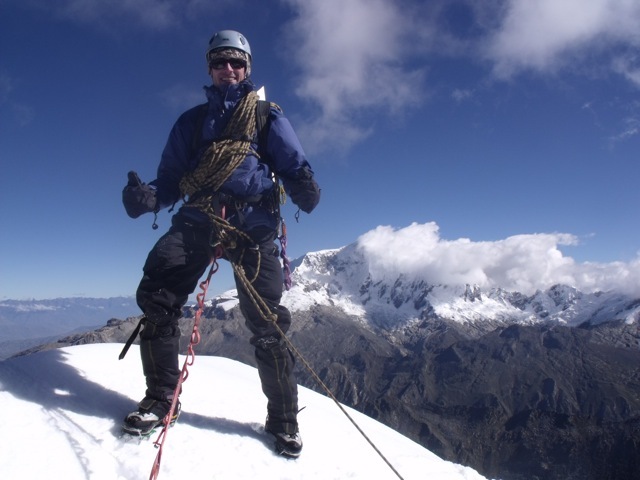 We reached the summit, out of breath, around 10 am or so and were rewarded with sweeping, panoramic views of the Cordillera Blanca and its playground of big, jagged mountains. We were 19,793 feet up, the second highest I’d ever been. The descent was pretty straightforward and we even got to do some fun rappelling on the steep sections. Back at high camp we rested for about two hours before breaking camp and making our way back down to base camp. We arrived a little after dark. My legs were jello and it took all my energy to cook dinner. The next day we rested, spending the day basking in the sun, playing cards, and having a few beers at the nearby refugio. We also prepared a bit for the next day’s planned climb of Ishinca mountain, another mountain accessible from the same valley we were in. 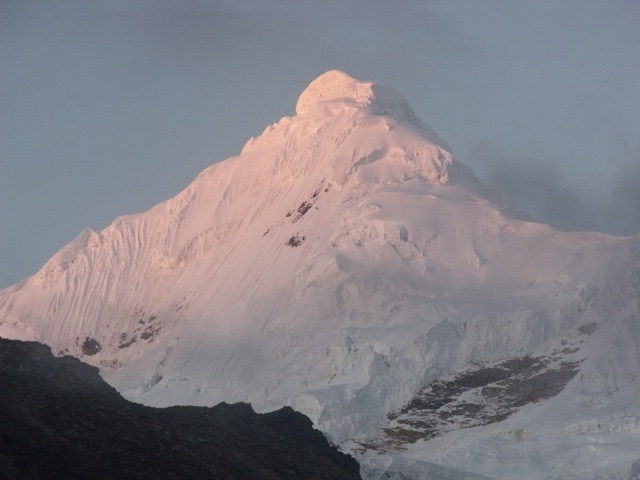 Because it would be less demanding than Tocllaraju, we decided to attempt this mountain ourselves, without a guide. It would be my first mountaineering trip without a professional guide, so I was pretty excited. The next day we woke up a little after 4:30am, a good 2 hours after we were supposed to wake up. Coincidentally, my watch battery died that night and we didn’t hear Sam’s alarm. 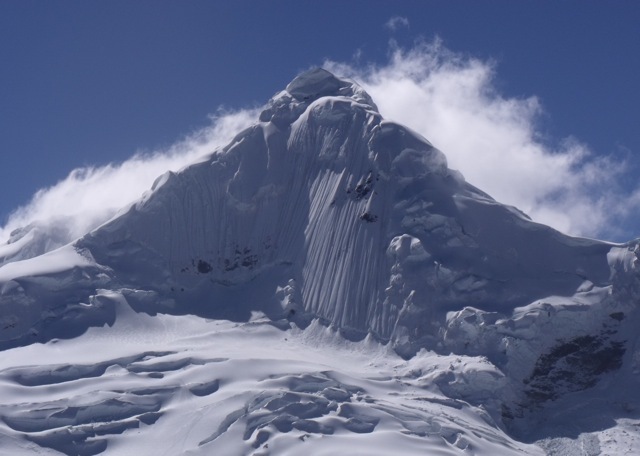 So, we awoke with a start and made the quick decision that we would have to scrap Ishinca and instead attempt Urus mountain, a similar mountain in terms of difficulty, but which we had heard would not take quite as long to summit. 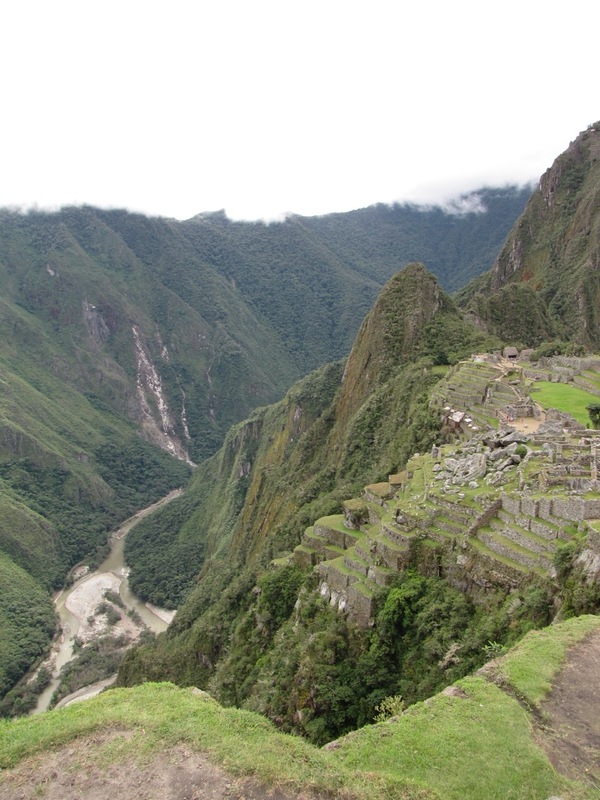 (We were a bit pressed for time as our mule driver was arriving at 1pm to take us back out of the valley.) Sky decided to stay at camp and rest since he was still recovering from altitude sickness, so it was just Sam and I. The first two hours we spent trudging, half-asleep, up a steep, rocky mountainside and trying to find the correct trail in the dark. 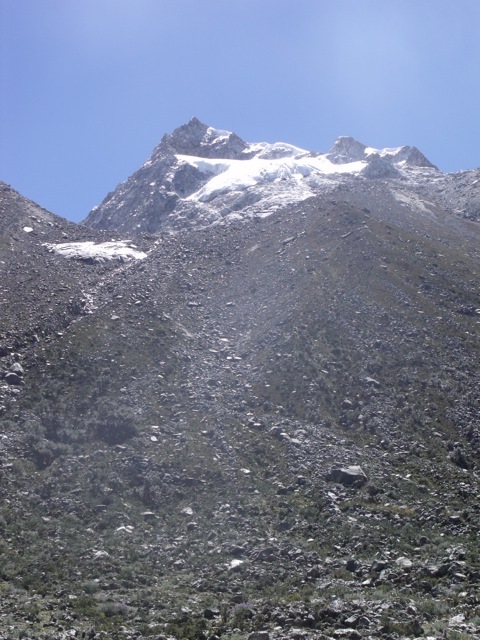 Finally we reached the snow fields and, under beautiful bluebird skies, donned crampons and roped up for the climbing. Sam was gracious enough to let me lead, which was awesome. 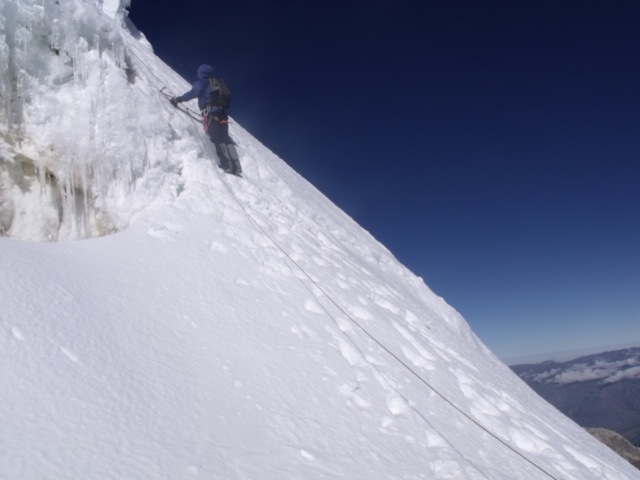 The climbing was not too difficult, though it required climbing on both snow and ice. We reached the summit, 5420m / 17,782 ft, after about 1.5 hours. The summit was a small snowy field protruding about 15 feet off some rocks and as I made my way, slowly, to the top, I peered over the other side and found myself looking straight down thousands of feet. 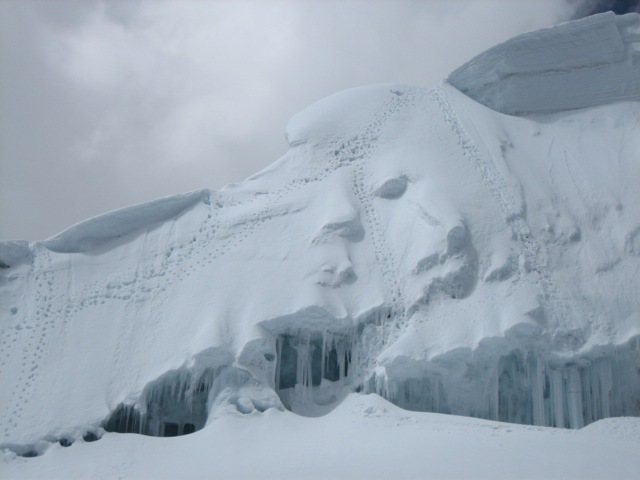 When Sam reached the top and gingerly peered over, he notice that the snow field was actually a giant cornice – i.e. a giant overhanging edge of snow formed by wind. Thus we quickly retreated several feet, slung our rope around a giant boulder, secured ourselves with some other anchors, and only then started snapping the requisite summit shots. On the summit blocks with Sam. Tocllaraju is visible over my left shoulder. Giving the climb a two thumbs up from the summit's precarious cornice. This snowfield overhung the rock by several feet and the other side was several thousand feet of air. We made it back to camp shortly before the mule driver arrived, who, when he did arrive, shared his surprisingly delicious lunch of rice and beans with us. 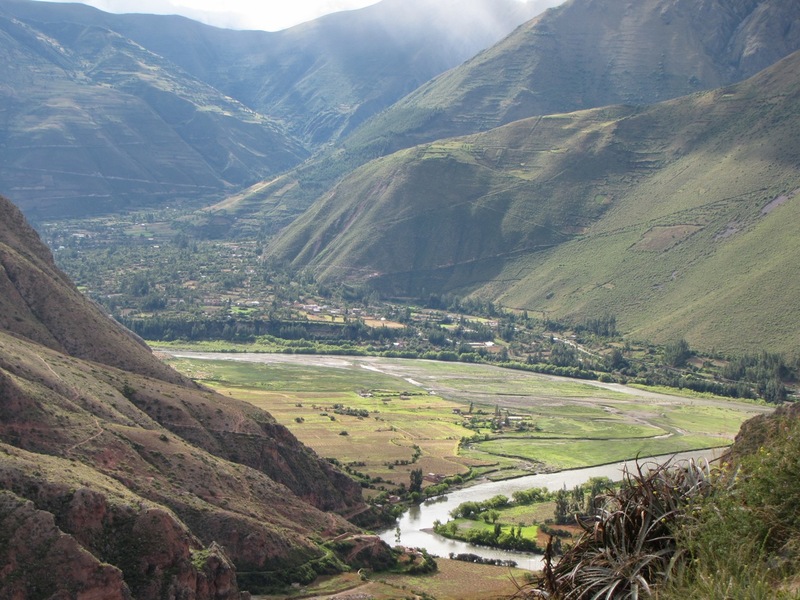 We then made our way back to Collon, then to Huaraz, and then directly to Cafe Andino to take advantage of the happy hour specials on daiquiris and pisco sours (the best I’ve had). I slept like a drunken baby that night. 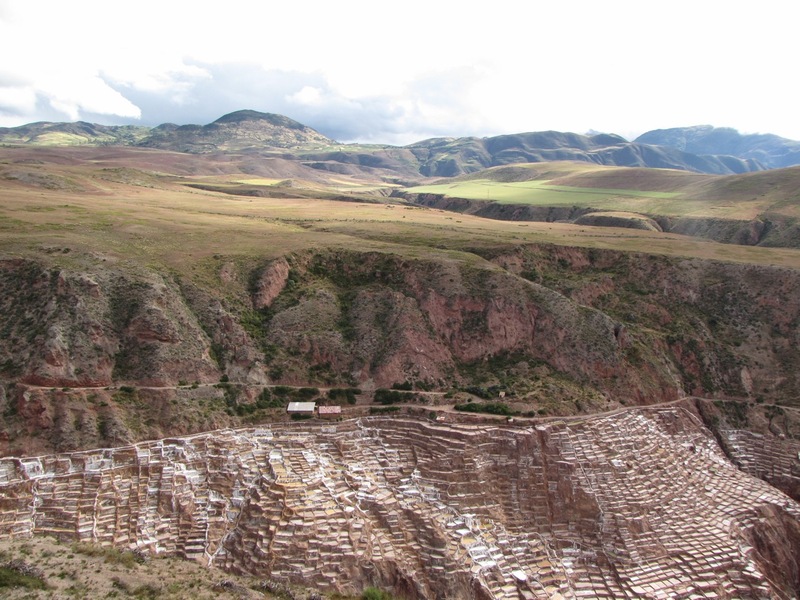 After leaving La Paz, Bolivia at the end of April I headed straight to Cusco, Peru, passing (up) Lake Titicaca on the way. 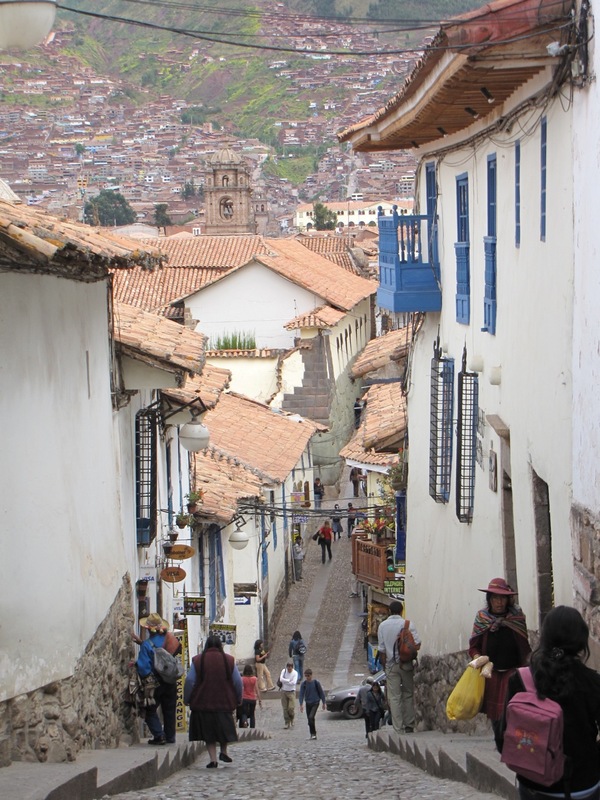 Cusco is a beautiful town with a Spanish colonial feel, nice restaurants, steep cobblestoned streets, gorgeous plazas, and excellent nightlife. 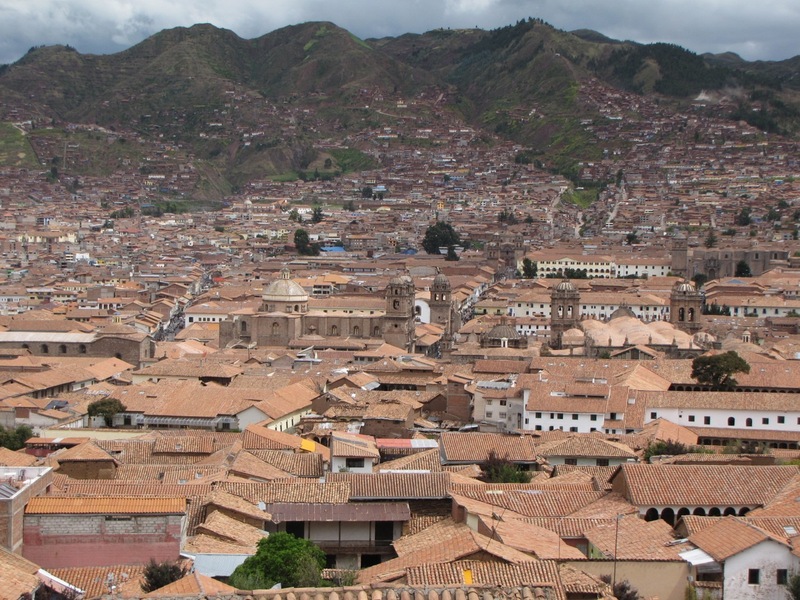 It was, at one point, the historic capital of the Inca Empire and, later, the center of Spanish colonization in the Andes. 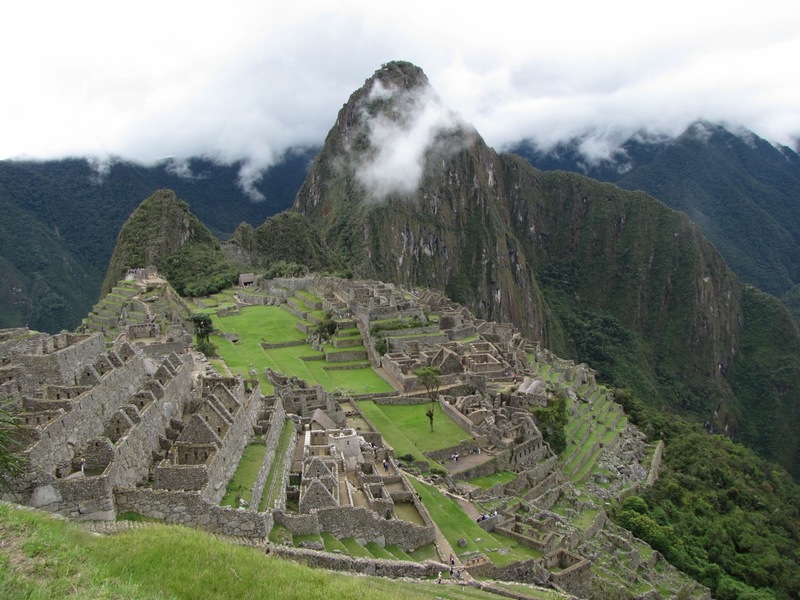 Today, it’s the capital of tourism in Peru, if not South America, thanks to it’s proximity to world-famous Machu Pichu. 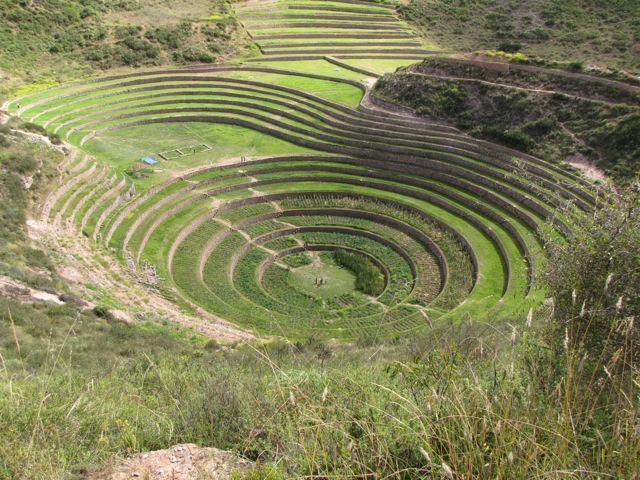 I stayed a total of three days in Cusco, bisected by a trip to Machu Pichu. 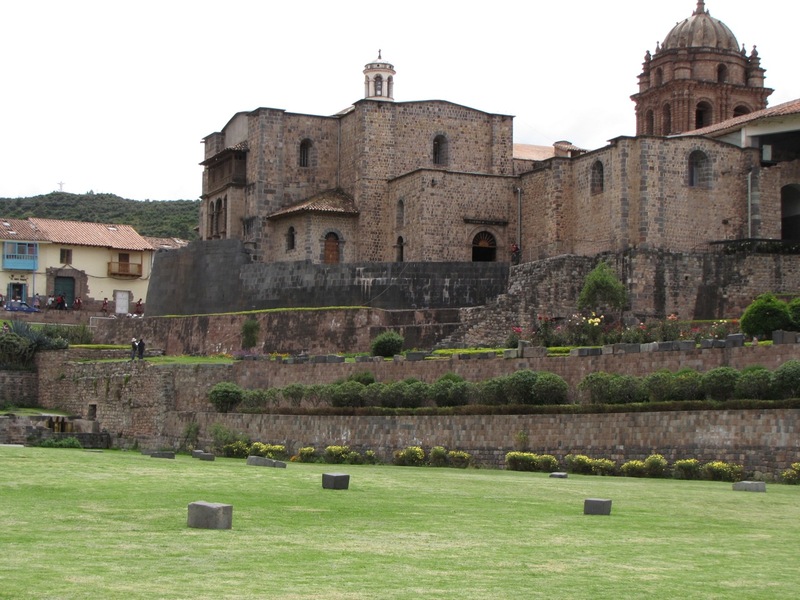 I arrived in Cusco with some desire, but no set plan, to see Machu Pichu. 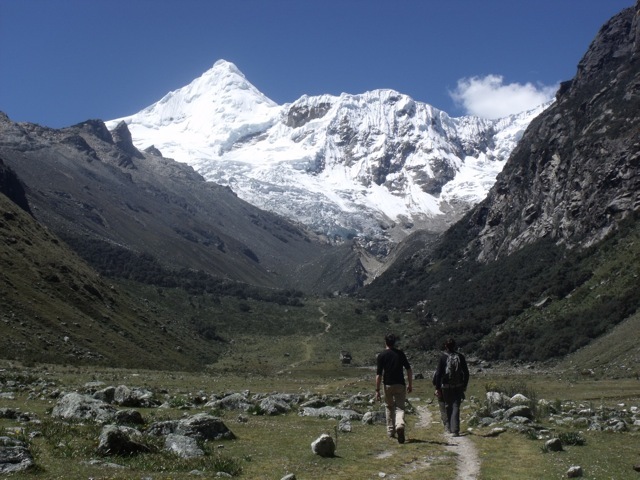 The most common way to get to MP is to hike the old Inca Trail, which takes about four days and crosses several mountain passes over 4000m. 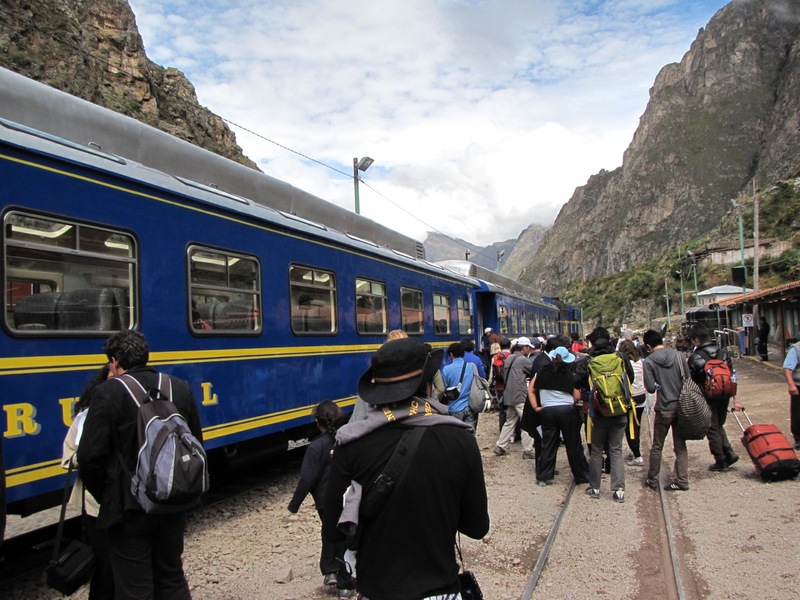 Since I hadn’t booked a trek months in advance, and since permits for the trek were sold out through the end of August already by April, I opted for the train – along with foot, the only mode of transportation possible – and was lucky to score a seat for the next day my first day in Cusco. (Floods and mudslides in January, which washed away portions of the rail line and closed MP to tourists, caused a massive back-up in tourism by the time I arrived.) 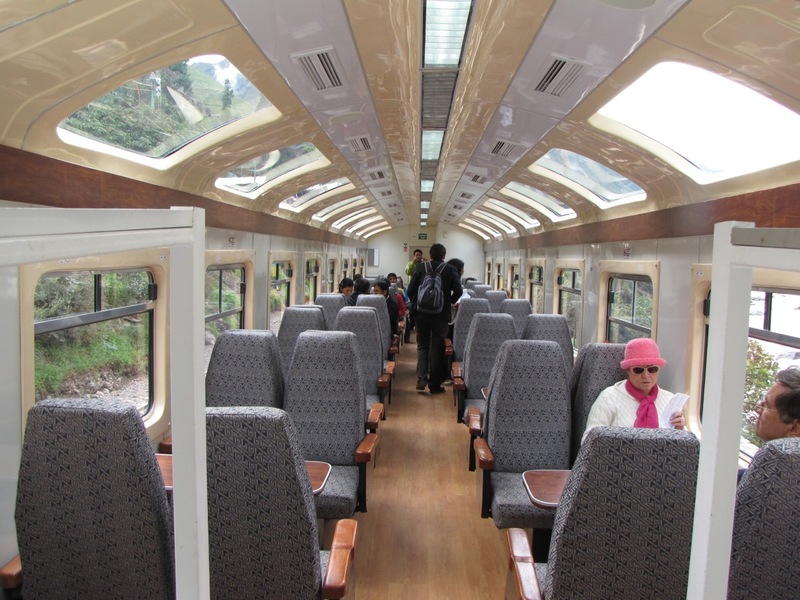 The train, which ended up not leaving from Cusco but from an hour away in the Sacred Valley, was a great way to travel – it’s comfy, clean, and has large panoramic windows that provide excellent views of the steep mountains through which the train winds. 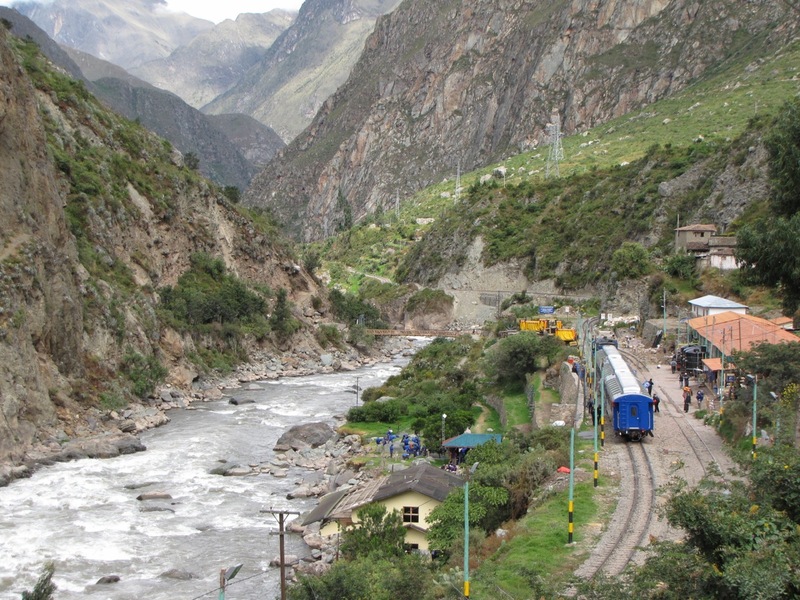 The ride lasts about two hours and terminates in Aguas Calientes, a disastrous little town at the base of the mountain on which MP perches – a town that exists only to serve tourists and that takes tourist-cheesy to a whole new level. 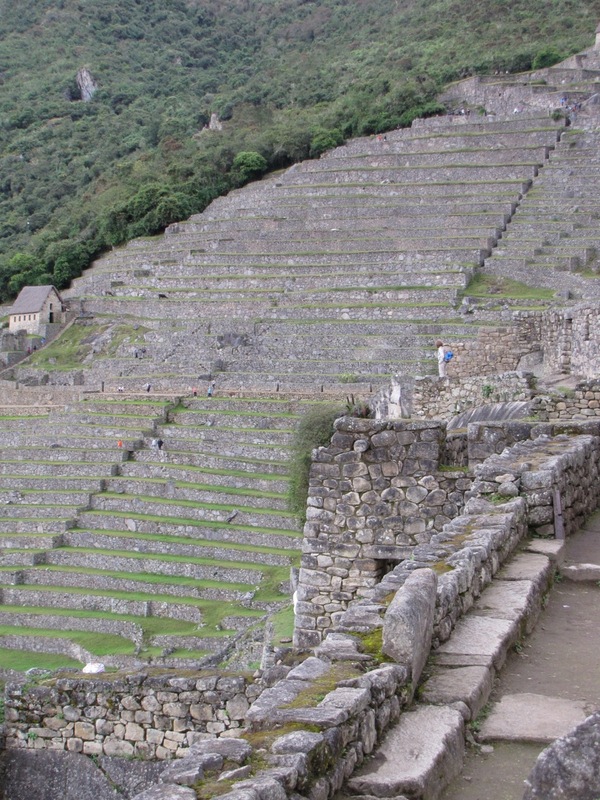 From Aguas Calientes, I grabbed a minibus up the steep and winding road that takes visitors up to Machu Pichu. 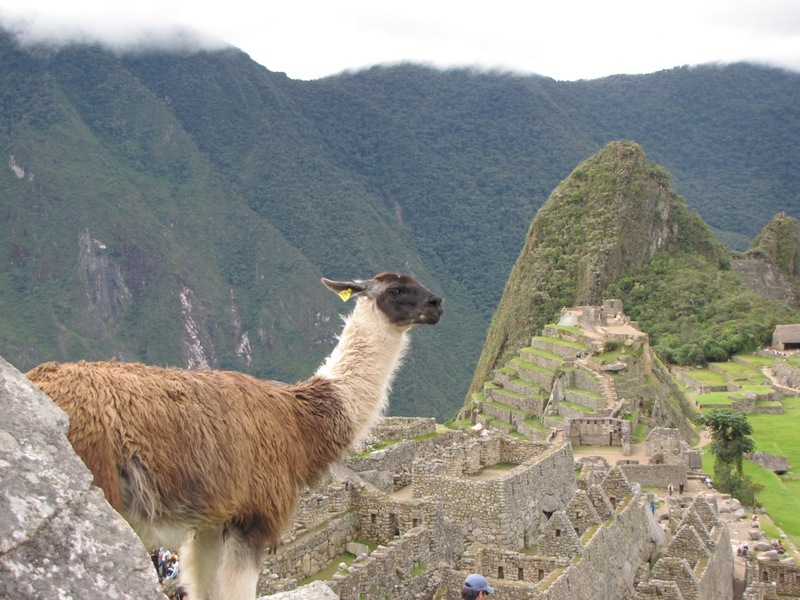 I had moderate expectation for Machu Pichu because, over the last two months of traveling in South America, I had heard so much about how great it is, and so tempered my expectations accordingly. I was, however, totally blown away. It is, without a doubt, one of the most beautiful and breathtaking places I have ever been. 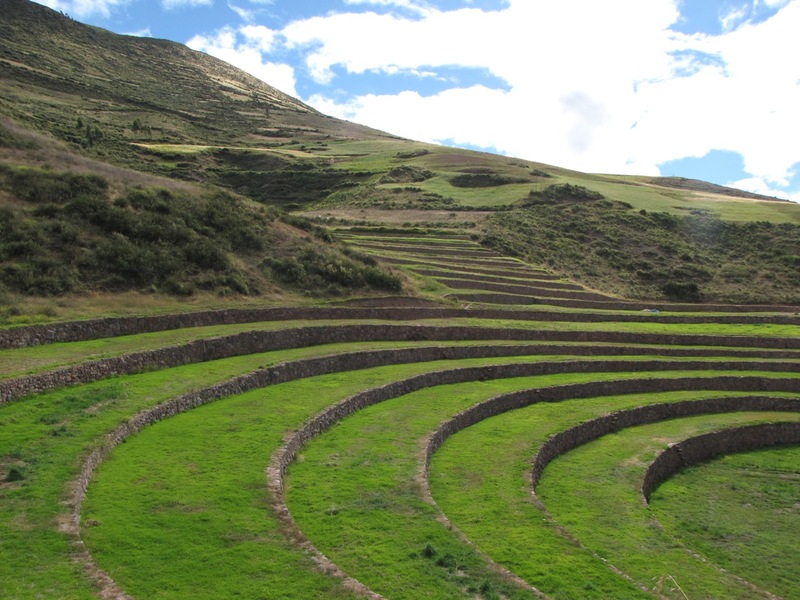 The ruins themselves are pretty neat, but for me it was the location of them that is most impressive – the Incas picked a most spectacular place to build this city. I wandered around for about 4 hours before I was finally shooed away by heavy rains, which seem to be a daily occurrence that time of year. 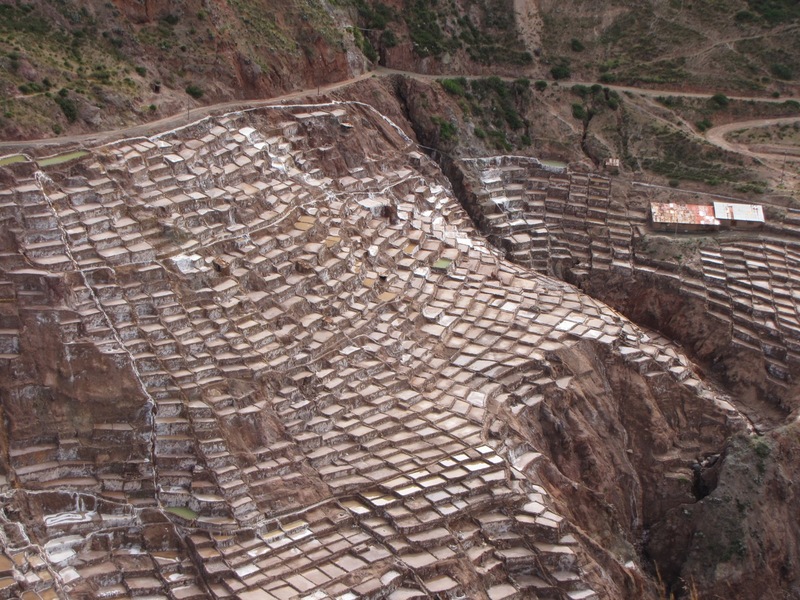 After spending a night in Aguas Calientes – the only option for staying at MP being a $400+ a night hotel room – I headed back by train to a town called Ollantaytambo, about halfway to Cusco and in Peru’s Sacred Valley. 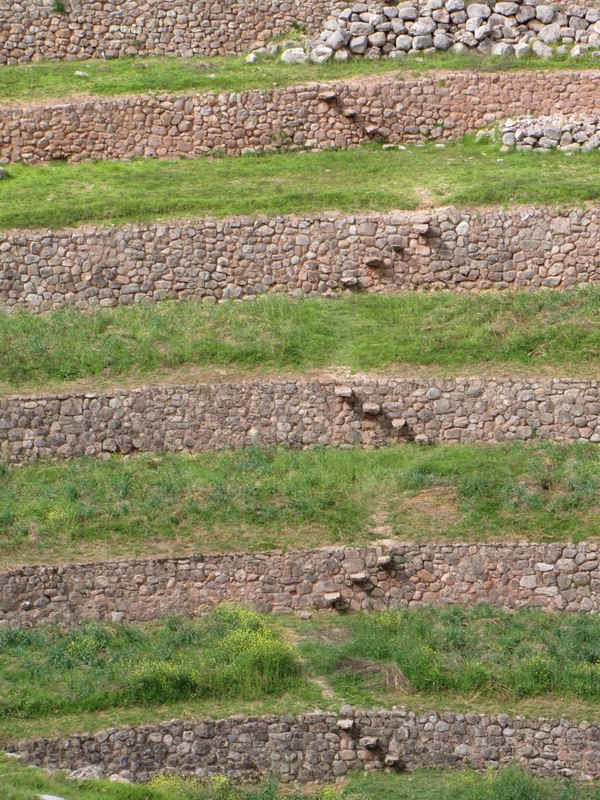 From there, along with two others from Spain, I negotiated with a taxi driver to take us the rest of the way back to Cusco via some other sights in the Sacred Valley. That afternoon provided an excellent opportunity to improve my Spanish as the other three spoke no English. 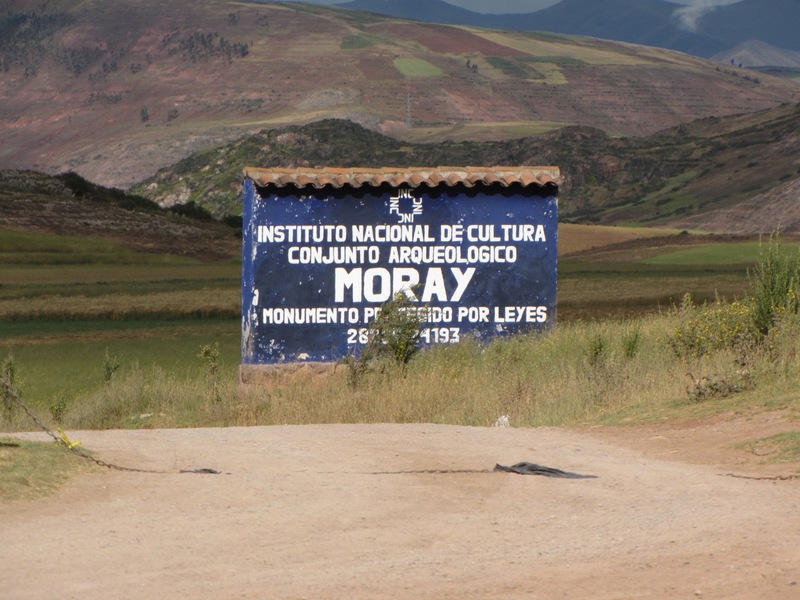 The first place we stopped was Moray, an Incan agricultural laboratory that was used to cultivate resistant and hearty varieties of plants high in the Andes. 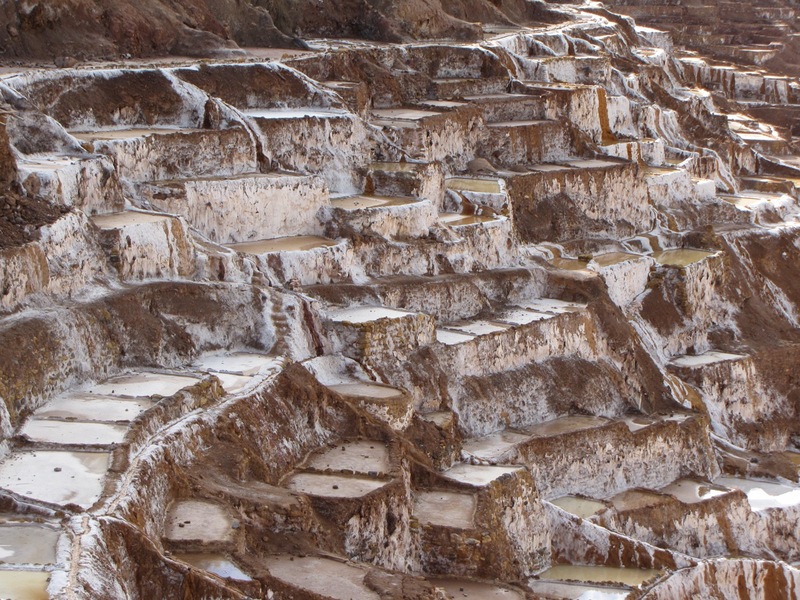 From Moray we drove to the salt plains at Maras, which were built by the Inca and are still used to produce salt today. Highly saline water from a natural spring is slowly diverted into and around hundreds of small (roughly one square meter) and shallow pools that have been dug into a hillside. The water then evaporates, leaving little collections of salt.